I am currently feeling under the pump, like I'm barely keeping afloat. Not only have I been battling a head cold and it is the end of the term, I am trying to tackle my data for my dissertation. 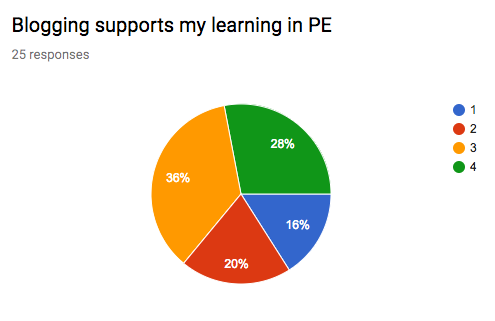 This post is a quick update with student feedback and major findings! Across the whole class I was interested to know their opinions about blogging within PE, and how/if blogging effects their learning in PE. A quick Google Form showed interesting results. These graphs are a little off, because I asked students to complete the Form at the start of Term 2 and then again at the end of Term 2, so some students responses changed. However, they are good visuals for immediate feedback. Students were given four questions, 1 representing disagree and 4 representing agree. After identifying their position on the scale, the students were asked to give a brief explanation for their position. - "Because blogging is alright and it can help me for my assessment but it can get annoying at times if we do it too much." - "I gave a 2 because I don't think what we learn in one particular class needs to be blogged to the public for every topic or session of p.e we have." - "I enjoy blogging because it help me to remember the things we've leant. I also enjoy blogging because I can get feedback from not only the teacher but also from my peers in the class." I was pleased to see nearly two thirds of the students thought blogging was effective/helpful for their learning. Upon reflection, it would have been useful to have discussions with individual students about their comments, to determine what students specifically found effective/useful (or not). - "It helps me be able to explain what we've learnt so far and how to present it to people". 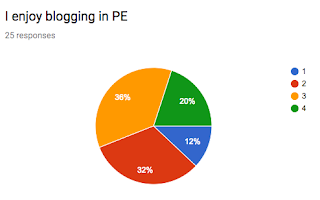 - "Blogging has helped to support my learning in PE because when I am absent I can always check everyone's blog on what they've learnt when I was absent. Therefore I can catch up with the class and be up to date". - "Because it can improve my writing". I think this question may have been too broad for the students, suggested by the variety of their responses. If I was to redo the Form, I think I would break down the four sections with subquestions, to specify what students may have found challenging. - "It's hard to see if I'm improving". - "It can be hard when I want my writing to be a good piece of work and when we have a time frame to complete it in. I find it good challenging but not when I'm under pressure". - "Sometimes blogging is challenging because there'll be times where I just don't know how to start my blog post, so I'm wasting time trying to know how to start my blog". This graph positively surprised me, as majority of the students consider blogging to be helpful for progression of learning. On the flip side, there were also a large proportion of students who didn't think blogging supported their feedback and feedforward. 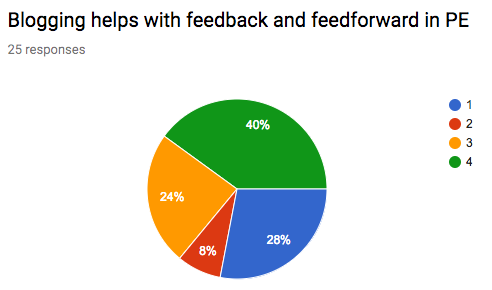 One thing I am exploring a little is how to give effective feedback, a skill many of our students are developing. Then, how to use feedback to grow. - "Because it gives people more ideas & to improve". - "Because we can get feedback and feed forward from other people around the world, not just people in our class". - "Not really because I don't read comments on my blog and no one really gives me feedback or feed-forward on what's on my blogs". I am focussing on three specific students and their comments and blogposts. These are coincidentally the top academic students in my class (these are the students who gave consent for me to use their data for my studies). The major themes/findings of my intervention from these three students are; blogging helps me as their teacher to identify gaps in students' knowledge, over time students became more reflective within their posts, students began to integrate feedback into future posts, and in class discussions/peer teaching increased. This is fascinating Georgia. The learner who finds it hard to get started resonates with me. I have wasted countless hours agonising over the opening paragraph of an assignment. Maybe some prompts on the wall or your site of suggested opening lines might help? Thanks for the suggestion Dorothy, I think that is a great idea. I know I often sit thinking about how to start a post, or as you mentioned an assignment - and it's incredibly frustrating! I started to encourage the students to get everything down they are thinking and then put it all into a logical order later. Isn't it interesting what they have to say? Obviously this is only a small snapshot, but some of the more intriguing comments.